Home > Photography	> 99 Years Old! 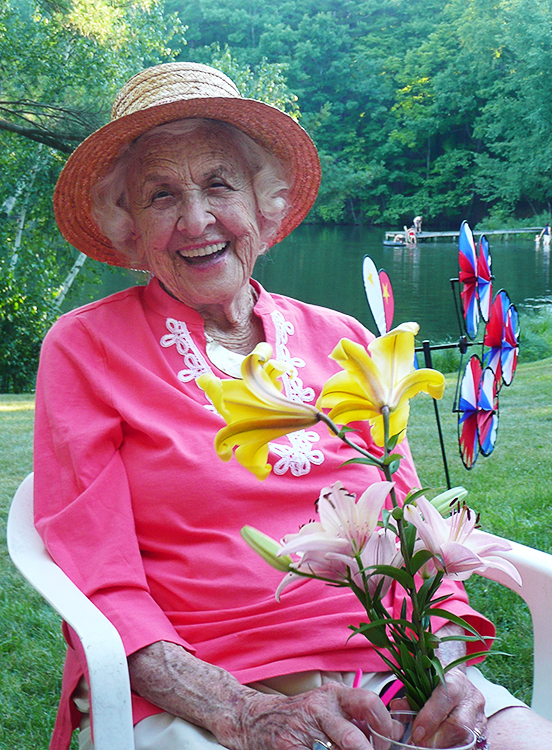 Hard to believe, but this extraordinary woman celebrated her 99th birthday on the 4th of July. Friends, children, grandchildren, great-grandchildren and I think a couple of great-greats traveled to a local pond via hay wagon to picnic and party. Faity Tuttle (born Esther Leeming) wrote a book several years ago that accurately describes her approach to life. “No Rocking Chair for Me: Memoirs of a Vibrant Woman Still Seeking Adventure in her 90’s” Available from Amazon. Widowed in her 80’s, she worked with a trainer to prepare for auditions and worked in many print and TV ads as the “white haired lady” until recently. If you would like to see and hear her now, she was taped recently by Manhattan Times for the NYC Parks Dept. Faity walks the High Bridge, a long closed foot bridge, and remembers visiting it 90 years ago with her mother and sister to see a plaque dedicated to her great-great-grandfather, designer of the bridge. She is a treasure. Also great fun. Thanks, you have a great blog here! I’m definitely going to bookmark you!